In the late 19th and early 20th centuries, almost two dozen transporter bridges were built around the world. 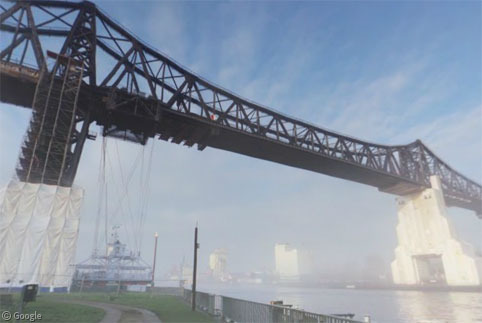 They feature a high gantry – tall enough to allow ships to pass below – carrying a gondola to transport foot passengers and vehicles across a waterway. Less than ten survive, though not all are still in use. 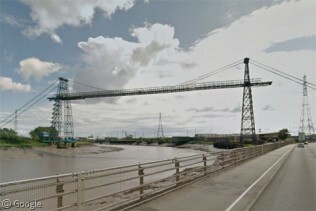 We’ll take a look at all of them, beginning with three in the UK, including the largest surviving example – the Newport Transporter Bridge which crosses the River Usk. This bridge was built in 1906, though it was closed from 1985 to 1995 and again from 2008 to 2010 for a restoration and repair work. The towers are 74m (242′) tall and the span is 196m (645′). This YouTube video gives a guided tour of the bridge. The waterway needs to be navigable by large vessels, meaning a low bridge was not suitable. The river banks are low, and the area needed to build approach ramps for the road to a high bridge would be far too large. A ferry can’t be used for various reasons, such as low tides which make docking impossible. As cars became more popular, the limited capacity of transporter bridges made them less suitable, with other alternatives such as lift bridges taking their place. 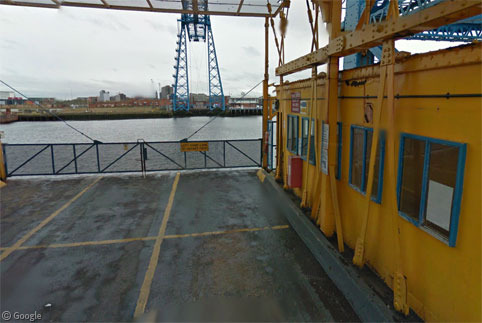 In north-east England, the Middlesbrough Transporter Bridge crosses the River Tees. It opened in 1911. 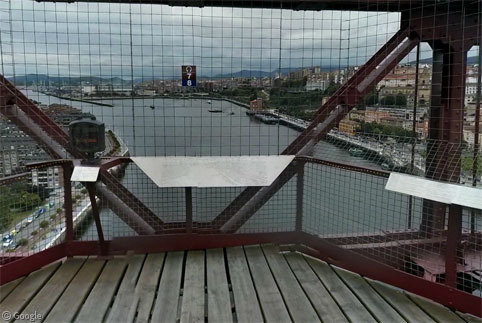 The Google Street View car even took a trip on the gondola, which has room for 9 cars or a couple of hundred people. This film celebrated the bridge’s centenary a few years ago. 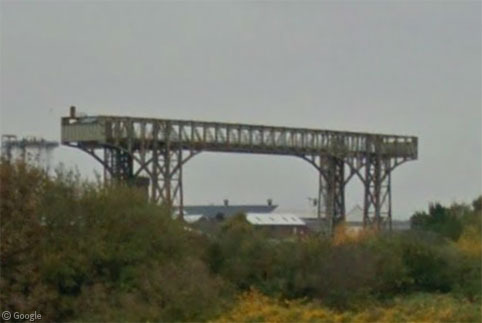 Meanwhile, in the north-west, the Warrington Transporter Bridge which spans the River Mersey was built in 1915, but has been unused for around 50 years. Even though it’s a listed building, it’s sadly falling into disrepair. It was originally used to transport trains to and from industrial plants in the area. Another identical bridge nearby was built ten years earlier but demolished in 1961. 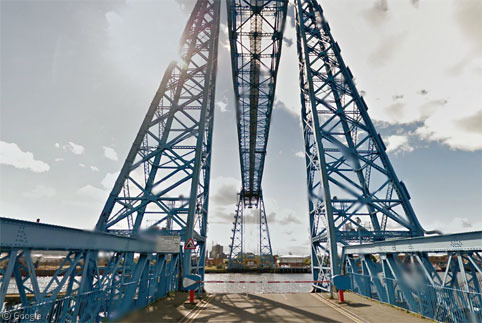 Moving to Spain, we find the first transporter bridge ever built, and the only one surviving from the 19th century. 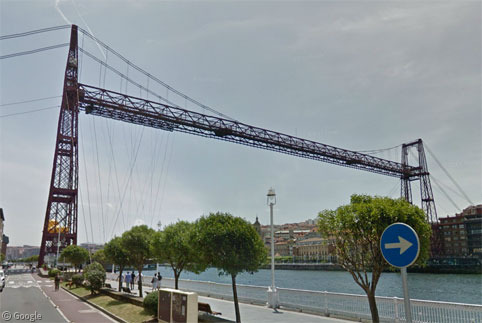 The Vizcaya Bridge (Also known as Puente Colgante, or the Hanging Bridge) was built in 1893 across the Ibaizabal River in Portugalete near Bilbao. It was declared a World Heritage Site in 2006. The bridge operates every 8 minutes during the day, and hourly overnight. The gondola holds up to six cars, and the trip across takes 90 seconds. We paid it a visit back in the early days of this site, and this video shows it in operation. Lifts in the towers allow access to the main boom for visitors looking for a scenic view of the town. Photosphere by Pablo Orduña. 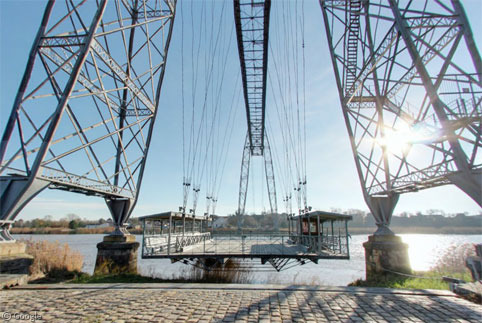 Two of Germany’s historic transporter bridges remain, including the Rendsburg High Bridge – built in 1913 and the only example ever to feature a railway track across the high span in addition to the gondola. This is a good example of the problem transporter bridges tried to solve. 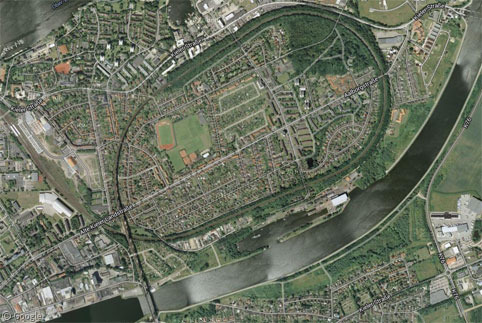 The railway has to do a huge loop north of the river in order to be able to then gain enough elevation to pass over the upper level of the bridge (seen at the lower part of this image) as it spans the Kiel Canal. 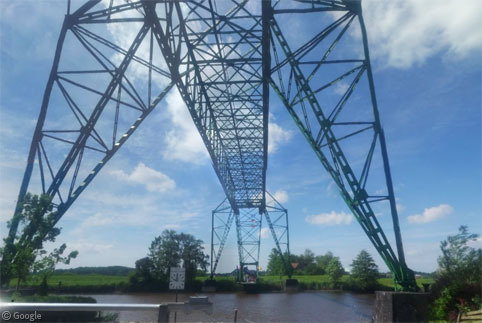 The other surviving transporter bridge in Germany is the Osten Transporter Bridge, built in 1909 and which is only in use as a tourist attraction. 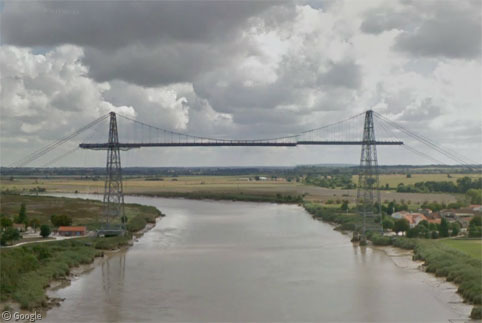 Only one bridge can still be found in France, the Rochefort-Martrou Transporter Bridge, built in 1900 and which operates for pedestrians and cyclists during the summer. This YouTube video gives a good view of the bridge in operation. Photsphere showing the gondola by gerard Besnier. 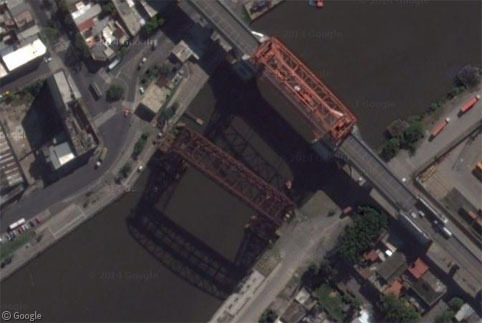 And the last surviving historic bridge on our list – although it hasn’t been used for decades – is the Puente Transbordador in Argentina, since an elevated bridge was built to replace it. 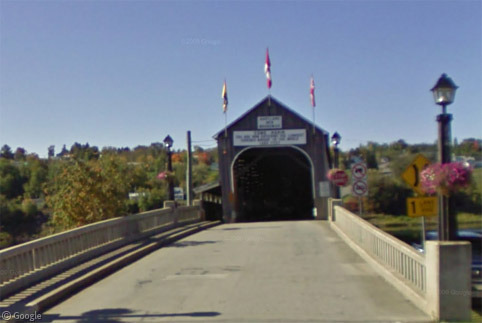 The old bridge is the darker red of the two in this image. 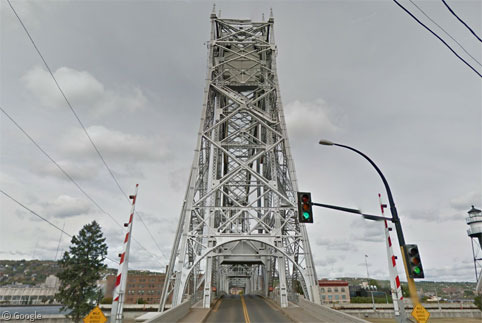 Finally, in Duluth, MN, an historic transporter bridge still stands but not in its original 1905 form – it was converted to a vertical lift bridge in 1929 – the Aerial Lift Bridge. Wikipedia has more information about each of these bridges. If you have used a transporter bridge (especially if it’s part of your daily commute) please tell us about it in the comments. And even though I spent quite a lot of time around the Kiel Canal I can only remember one time actually using the Gondola to cross it.